We can get pretty detail-oriented in our analysis of the polls here at FiveThirtyEight. But sometimes there is also value in applying a simpler approach. One simple thing I’ve noticed is this: Mitt Romney has held the lead recently in quite a few swing state polls. That wasn’t the case in June or July, when Barack Obama held leads in those polls far more often than Mr. Romney did. Right now, our forecast model classifies the 10 most important states in the Electoral College as follows, and in the following order: Ohio, Virginia, Wisconsin, Colorado, Pennsylvania, Florida, Iowa, Nevada, New Hampshire and North Carolina. If you simply count the scientific polls that have been conducted in those states since Aug. 1, Mr. Obama has led in 13 of them, Mr. Romney has led in 11, and there have been two exact ties. 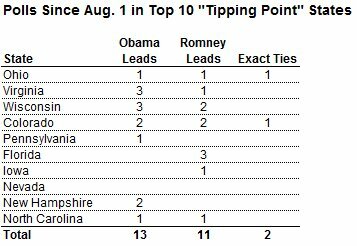 This marks a contrast from June and July, when Mr. Obama held leads in polls of the top 10 states about four times as often as Mr. Romney did. If you read the fine print on the polls, then things don’t look quite as good for Mr. Romney. In the polls where Mr. Obama has held a lead, it has generally been by a somewhat larger margin than when Mr. Romney does. And the polling firms that have been most active in the states recently have been a bit Republican-leaning on balance — and a few of the polls have been outright weird. It’s also plausible that this is partially a statistical fluke, since we really haven’t gotten all that much data. So far in August, we’ve logged 35 state polls in our database, counting both swing states and noncompetitive ones. That puts us well behind the pace from four years ago, when there were more than one hundred state polls conducted in the month of August. But our forecasting model, which makes an effort to account for these sorts of factors, nevertheless finds that Mr. Romney has made up some distance in the swing states. A few weeks ago, we were starting to see a gap between the popular vote and the Electoral College. Generally speaking, our model was giving Mr. Obama about a two-in-three chance (67 percent) of winning the popular vote, but slightly better than a 70 percent chance of winning the Electoral College. Now? Our popular vote forecast really hasn’t changed very much. As of Tuesday night, our model gave Mr. Obama a 66.9 percent chance of winning the popular vote. But the gap between the Electoral College and the popular vote has pretty much dissipated. Mr. Obama was given a 67 percent chance of winning the Electoral College in Tuesday’s model — almost exactly the same odds as in the popular vote forecast. Perhaps a more important qualification is that many of these polls were conducted shortly after Mr. Romney named Representative Paul D. Ryan as his running mate. Candidates typically get a temporary bounce in the polls after naming their vice-presidential nominee, but it usually dissipates soon and their polling may be slightly inflated in the interim. This is not something that our model adjusts for. Even so, I don’t think we should totally write off the idea that Mr. Romney has made up some ground in the swing states. Apart from his selection of Mr. Ryan, there are other things going on in the campaign. For example, Mr. Romney’s advertising advantage in swing states could be starting to pay dividends.